Yesterday, Sotheby’s made a comeback during the New York auction, making excellent sales even though it was a December auction in NY and not the November auction in Geneva, which normally sees the biggest sales of the year. The famous auction house sold $53,935,050 this year, double the very modest sales during 2016’s event in the same month and city which sold $25,123,750. Some very unique pieces were offered this year, which accounts for the majority of the sales. Last year Sotheby’s did not excite investors to this extent. The biggest sale of the night was a Fancy Vivid Blue diamond, despite the fact that another Fancy Vivid Blue diamond failed to sell in Geneva just last month. This reinforces our conclusion after that auction when that diamond did not sell. If it didn’t sell, it is due to that particular diamond’s characteristics, and not any decrease in investors’ demand. Where there is quality, there are investors willing to pay. 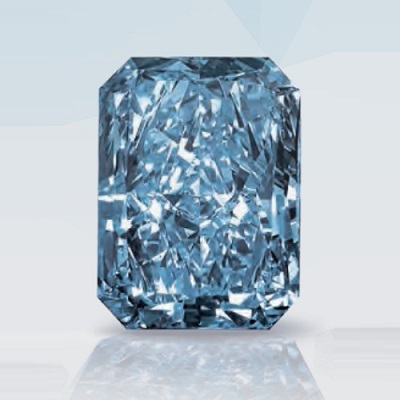 Not only was the highlight of this auction blue diamonds, one of them broke a new world record! The first star of the evening had a successful sale. 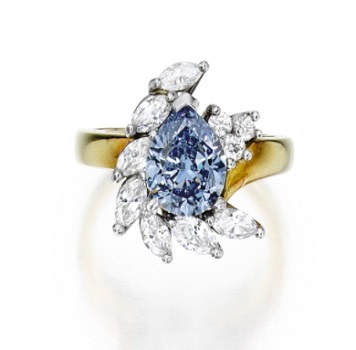 It was the 5.69 carat Fancy Vivid Blue VVS1 diamond that was valued between $12 million and $15 million, and ended up selling for $15,130,800, or $2.66 million per carat, This sale had a strong price, which continues the overall long term behavior of the market for unique and rare diamonds. Any Fancy Vivid Blue diamond weighing 5 carats or more is extremely rare and any opportunity that an investor can allow himself or herself to acquire such a diamond should be taken. 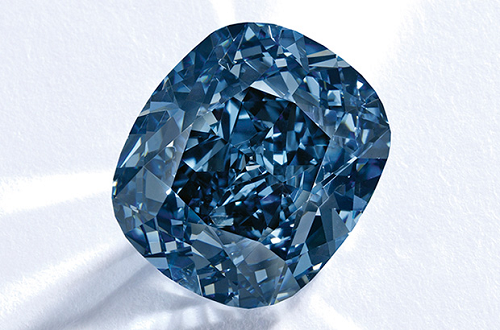 The second star of the evening in fancy color diamonds was the new world-record-breaking Fancy Intense Blue diamond. The 2.05 carat Fancy Intense Blue pear shaped IF diamond was estimated to be sold between $1 million and $1.5 million, but ended up selling for $2,655,000 or $1.295 million per carat, a 77% premium to the high estimates. This is a new world record price per carat for any Fancy Intense Blue diamond in the 1-3 carat weight category. 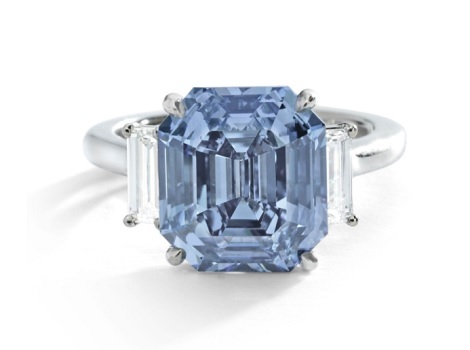 The previous record for this color and weight category was held by the 1.74 carat Fancy Intense Blue VVS1 round diamond that was sold exactly two years ago in New York at the Christie’s December diamond and jewelry auction. That diamond was sold for $1.1 million per carat. Let us remind you that in the last few years, no new significant rough blue diamonds have come out of the ground in any of the diamond mines around the world. Since 2015, only 2 significant blue diamonds were released, the 12.03 carat Fancy Vivid Blue “Blue Moon” diamond and the 24.18 carat, Fancy Intense Blue “Cullinan Dream” diamond. Other than these two, no other new rough diamonds have appeared so the majority of significant blue diamonds appearing at auction are previously owned diamonds. They are owned either by collectors or investors that have held them long enough to cash out and invest in other diamonds. Another successful sale last night was lot #152, the pair of pink diamonds in a ring. They were a 1.38 carat Fancy Purplish Pink diamond and a 1.31 carat Fancy Pink diamond, both with VS1 clarity. The estimated price was between $200k to $300k, and the ring ended up selling for $411k, a 37% premium to its high estimates. 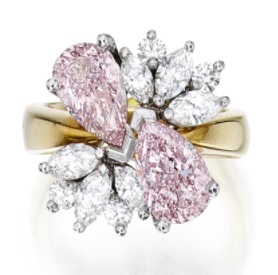 The sale price was in line with current valuation for such pink diamonds, both in color depth and size. 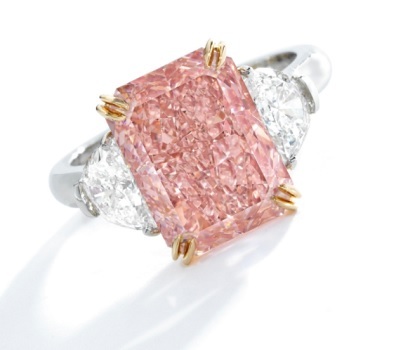 One of two less fortunate items that did not meet buyer’s expectations was the 5.24 carat Fancy Intense Orangey Pink diamond which was valued at between $1.8 million to $2.2 million. This diamond ring failed to sell. The other disappointing item that failed to sell was the pair of yellow earrings. 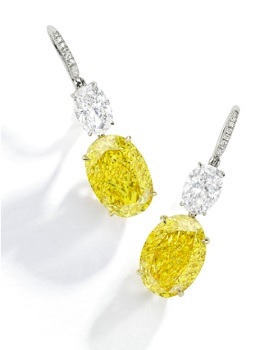 The 5.99 carat and 5.45 carat Fancy Vivid Yellow diamonds with SI1 clarities were valued at $1 million to $1.5 million. This auction is the last significant one for Sotheby’s this year. It is clear to the entire diamond industry that strong prices are still being paid for the unique and deserving items, while less exceptional items returned home. Like in any competition, not everybody goes home with a medal. Only those deserving ones do, and these days, they have to be considered a true One of a Kind! Happy Holidays to all.